The AgriDry Gravity Grain Spreader is the only spreader that will spread the fines of the grain without compromising quality. Our spreader is gentle on the grain. Uniformly distribute fines with the AgriDry Spreader to eliminate coring so you can store and sell all your grain. The AgriDry grain spreader distributes fines. This has cost savings benefits by reducing the time and money it takes to core the center of a bin. It will also create a better environment for the grain during storage. 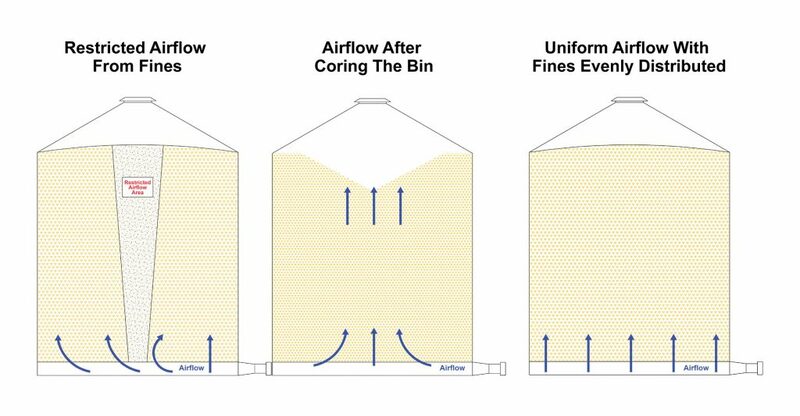 With even distribution of fines, your fans will be able to reach all of the grain, improving fan efficiency and increasing the time you can store your grain which helps when markets are low.